Tech’s track and field squad has traveled far and wide this semester with meets across the eastern United States. A strong showing at the Clemson Invitational, highlighted by senior Avery Bartlett breaking the school record in the 1000-meter event — a record previously held by the current women’s track and field head coach, Alan Drosky — provided a strong baseline bolstered by multiple personal records and top finishes for the Jackets as they rolled into the Vanderbilt Invitational this past weekend. The Vanderbilt Invitational began with a first place finish for the men’s distance medley relay team of senior Chris Korabik, sophomore Tyler Whorton, junior Mike Reilly and freshman Joshua Williams, as the team finished with a time of 10 minutes, 4.17 seconds. The mix of seasoned upperclassmen and talented underclassmen bodes well for the team in years to come, as underclassmen such as Whorton and Williams gained valuable experience competing on top-tier relays alongside more senior teammates. The women continued the success established by the men’s distance medley relay, with freshmen Denise Issah and Taylor Grimes qualifying for the ACC Championships in their long jump events. Junior Brianna Hayden had a notable 200-meter performance according to Coach Drosky, although the 60-meter event was where Hayden placed the highest last year at the conference championship meet. Day two of the Vanderbilt Invitational showcased the hard work of the Jackets as the team set more than 15 personal records, capping off a weekend where the Jackets set over 25 personal records in total. Senior Maurice Simpson, who came to Tech from Kentucky during the 2017 season, finished in seventh place while setting a personal record time of 6.87 in the 60-meter event. Simpson has consistently improved his times since arriving at Tech and finished No. 26 overall at the ACC Championships last year in the 60-meter dash. He placed No. 18 in the 200-meter event at the same meet last year and made significant strides at meets during the outdoor season, which takes place later in the spring semester following the indoor season. 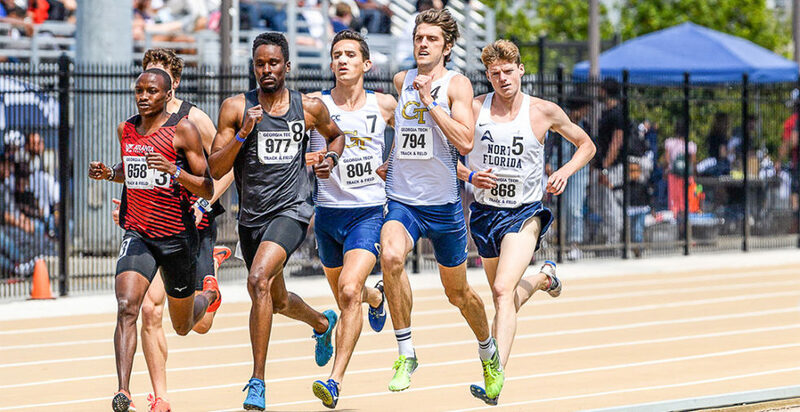 Bartlett kept the ball rolling from his performances at Clemson by posting a personal record time of 4:03.61 in the mile, finishing fifth for the Jackets. In comparison, he posted a 4:12.77 at the same meet last year, a significant improvement. Last season, Bartlett finished fifth at the ACC Championships in the 800-meter event with a time of 1:47.58, then proceeded to earn second-team all-America honors in the 800-meter after running a slightly slower time of 1:48.24 at the NCAA Indoor Championships. During the past outdoor season, he secured the championship title at the ACC in the 800-meter in 1:48.05. However, outdoor times can vary more than indoor times due to weather and wind. Bartlett has made multiple nationals appearances and is certainly expected to return to the nationals this year in his final season with the Jackets, especially if he keeps up his recent pace. On the women’s side on the second day at Vanderbilt, senior Jeanine Williams finished first in the 60-meter hurdles with a time of 8.17. Last season, Williams held the top time in the ACC in the event with a career-best time of 8.02. She was ranked fourth in the country and No. 22 in the world with that time and finished first or second in every competition during the indoor season except one. Williams turned down an offer to represent her home country, Jamaica, at the IAAF World Indoor Championships in England last season to compete for the Jackets at the NCAA Championships. During the outdoor season, Williams was awarded the title of second-team All-American in 100-meter hurdles, All-ACC First Team and 100-meter Outdoor ACC Champion. Her ability to compete at such a high level in both the 60-meter and 100-meter hurdles makes her a versatile weapon for the Jackets. She will certainly be chasing more titles this year in those events, along with the relays that she participates in with the team. The Jackets return to Clemson, S.C. for the Bob Pollock Invitational, kicking off January 25 and running through January 26. The team will then compete at the University of Michigan Invitational meet during Super Bowl weekend in Ann Arbor before coming back to the south for another invitational meet at Clemson. Some of the team will also be competing at either the Music City Invitational at Vanderbilt or the Iowa State Invitational in Ames, Iowa on the same weekend. These meets will build up to the ACC Indoor Championships during the weekend of February 21, which will be held in Blacksburg, Va., home to Virginia Tech.